I thought about calling this post ‘Regrets’. Reading through allotment blogs yesterday afternoon it seems that everyone is feeling like they are behind with their planting and seeing the still empty beds on our plot I am no different. Looking through photographs I took last year to see if it really was the case I came across this taken on the fifth of June. 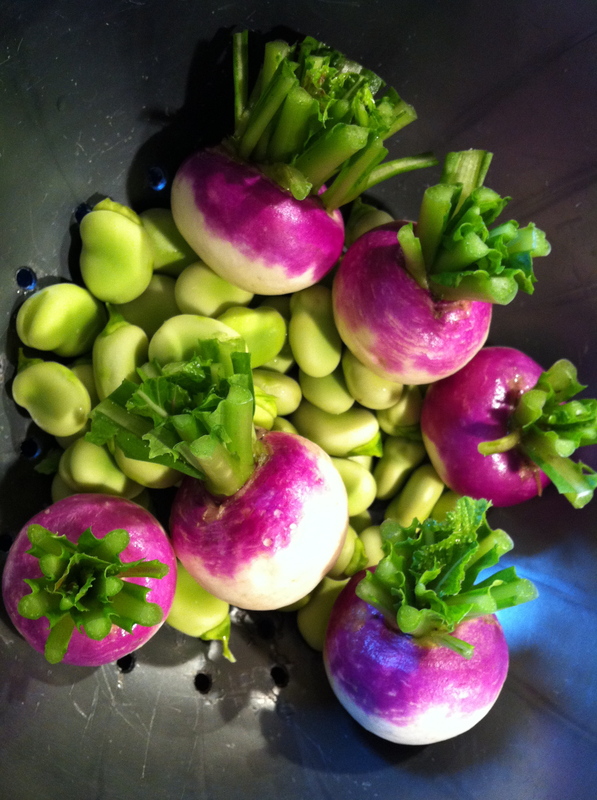 So firstly there’s no way I’m going to be picking broad beans in two weeks time and secondly, despite having made a very conscious decision to grow fewer varieties of vegetables this season, why haven’t I planted any of these gorgeous turnips? The variety is Atlantic and they are part of the Thompson and Morgan Kew Urban Garden Collection. The good news is that they are comparatively quick, two months from direct sowing to harvest, and there’s still time, up until August in fact. They are delicious par boiled and roasted. I’m dashing off to the local garden centre to buy some seeds. Same here re the broad beans, the pods are just forming. I think in reality what stopped us with the turnips was that we had too many at a time when we wanted more salady things. Going to plant later so they are ready for early autumn.